When I first learnt how to make chili on Bebob's request, I always thought that I had accomplished a great deal since this was the first real Mexican food that I made. But I was wrong, according to Wiki and History and Legends of Chili, Chili Corn Carne, chili is not Mexican food at all. Although the real origin cannot be known for certain, there is no doubt that it evolved and got popular in Southwestern American, in particular Texas where chili is the official state food. 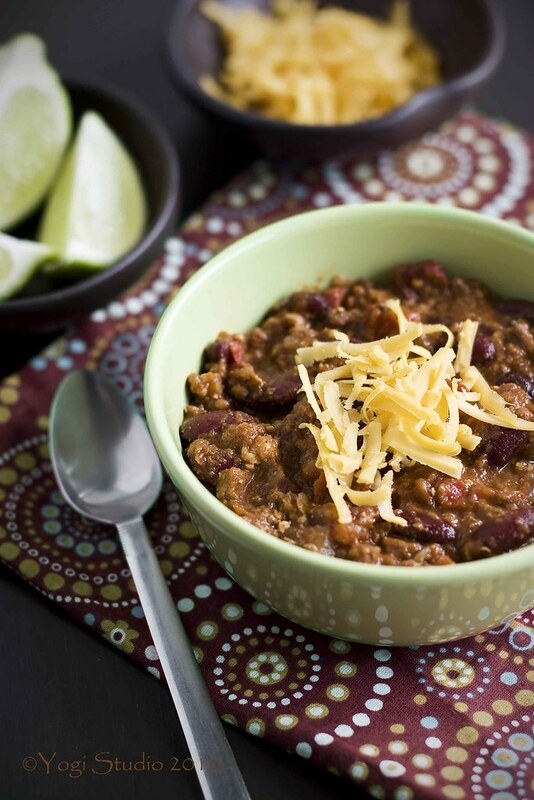 No matters where it came from, a bowl of rich and lush chili is always a soothing meal. 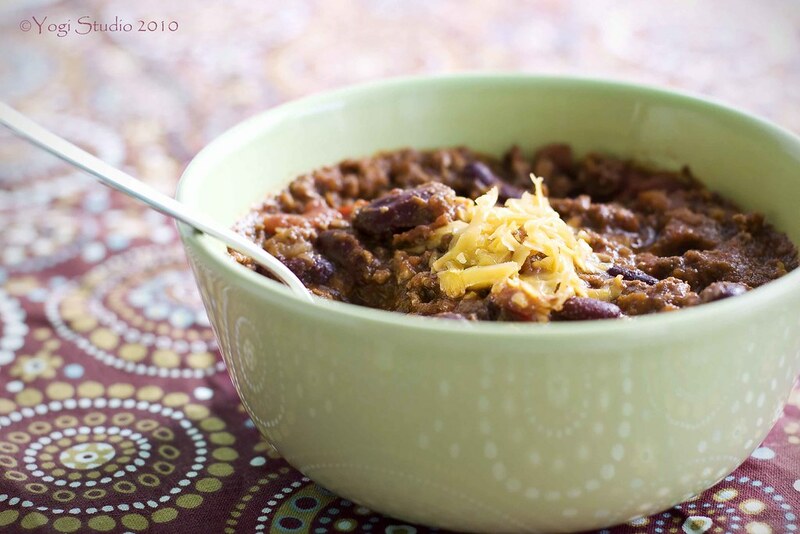 This recipe of simple chili is adapted from the The Best Recipe by Cook's Illustrated. It is so simple and easy to make by using stable available in supermarket and yet the flavor it produces is deep and complex. Cook veggies with spices - Heat oil in large Dutch oven over medium heat until shimmering but not smoking, about 3 to 4 mins. Add onions, bell pepper, garlic, chili powder, cumin, coriander, pepper flakes, oregano, and cayenne. Saute until veggies are softened and started to brown, about 10 mins. Cook meat with veggies - Turn heat to medium high and add chicken to the veggies. Cook until chicken is no longer pink, about 3 to 4 mins. Add beef and cook until it is no longer pink, another 3 to 4 mins. Breaking up large clumps of chicken or beef with wooden spoon during cooking. Add beans, tomatoes, tomatoes pureer and 1/2 tsp salt; bring to boil and then reduce heat to low for simmering, covered and stirred occasionally, for 1 hour. Remove cover and let it continue to simmer, stirring occasionally, for another hour or so, until the meat is tender and the chili is slightly thickened. Taste it and adjust seasoning with salt. Serve with lime wedges and other condiments, such as diced avocado, chopped red onion, sour cream and shredded Monterey Jack or cheddar cheese. Original recipe is made with all beef. To make it a bit leaner, I substituted half of the beef with chicken. I have tried the recipe with all extra lean ground beef but the result was unsatisfactorily. With half of the chicken, the rich beefy taste is still there. Original recipe is made with 1 can diced tomatoes with all the juice and 1 can tomatoes puree. I do not usually keep tomatoes puree in my pantry, so I made my own with whole tomatoes. Sometimes I use crushed tomatoes. No matter what you use, just watch out for the amount of liquid. If it seems to be too runny, just reduce the amount of juice from the diced tomatoes added to the pot. This sounds really, really good. I'm really excited to start following your blog. Your photos are absolutely gorgeous! Thank you for your nice words. They mean a lot to a new blogger like me. BTW, your cupcakes are all so cute and yummy looking! Looks so yummy! I will try it.